Sometimes, we’ll have a guest on the #WeGotGoals podcast who doesn’t actually like or set goals (I’m looking at you, Dawn Jackson Blatner and Josh Katt). For whatever reason, they don’t connect to the term, or they’ve employed a different paradigm to accomplish great things. Which is fantastic—one of the best things about the show, in our humble opinions, is the glimpse at the wide variety of paths high achievers have taken to reach success. But this week’s guest, Nicole Bernard Dawes, has the opposite perspective. Goals drive nearly everything the founder and CEO does. She aims to set both ambitious aspirations—say, starting an organic snack company, Late July Snacks, that hit $100 million in sales this year—and small mini-targets, including what she wants to get out of each business meeting. And she’s not afraid to lay them all on the line. 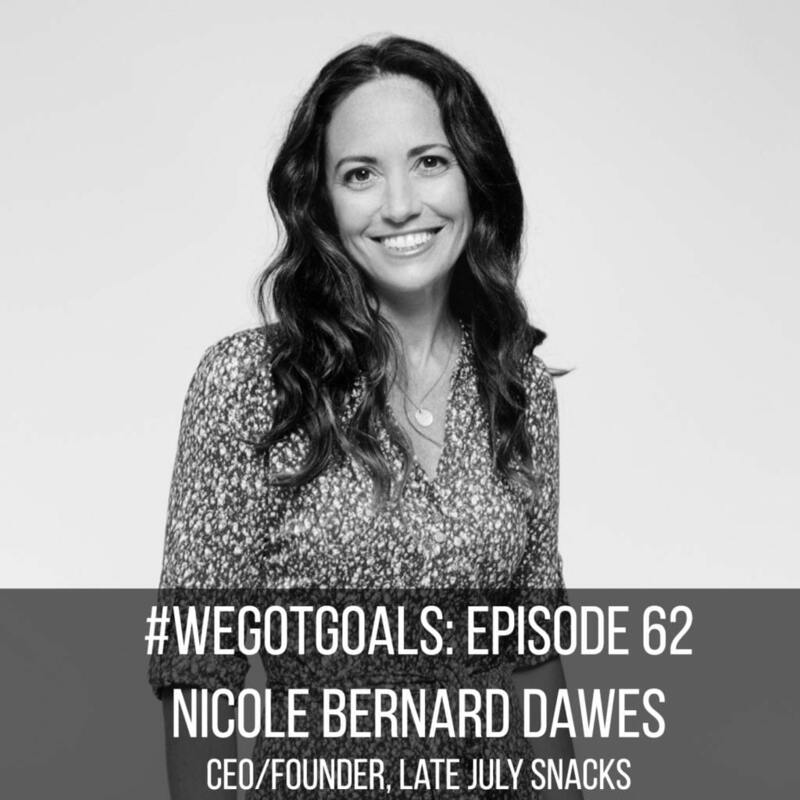 Setting goals helped Dawes recover from an incredibly difficult year in 2009. First there was the recession. Then her father Steve Bernard—her co-founder (and, before that, the founder of Cape Cod Potato Chips)—passed away from pancreatic cancer. When he died, the bank called the loan, leaving Dawes and her husband/business partner Peter scrambling to raise cash. “Through that, it forced my husband and I to take a hard look at kind of who we were at Late July and what we wanted this company to really become,” Dawes says. What did they decide and how did they pull through? In our interview, Dawes shares seven lessons that kept her moving forward. … and a purpose you’re passionate about. Start new things small and build. It took a year to perfect and introduce the tortilla chips, and they got off to a rocky start. “That was a little bit scary because we had just bet our entire company’s future on this launch,” Dawes says. That taught her Late July needed to build brand awareness in this new space. So, they spent the next year concentrating on a few key accounts, securing a foothold there before spreading their wings to the larger marketplace. That focus helped them course correct quickly. “I think we might have become the number three in the first year,” Dawes says. How, exactly, does Late July makes its chips so scrumptious? Besides constant comparison to competitors and making sure the whole team is eating—and loving—them, Dawes says they stay alert for constructive criticism. She applies this philosophy to all areas of her life and business; it’s a key component of her overall positive outlook. “We’re all just kind of learning and growing, and none of us are perfect. The more receptive you are to hearing things that could be done better, the more likely you are to improve faster,” she says. Set goals outside the boardroom, too. “I manage stress, I think, weirdly well,” Dawes says. Some of that may come naturally, but she also finds a solid fitness routine enables her to perform her best (a sentiment that makes us smile here at aSweatLife). A couple of years ago, Dawes got a Peloton bike—and thinks they should be standard issue for any entrepreneur. Now, she has no excuse not to knock out a 20-minute ride, even on her busiest days.